Is Portland’s new elected mayor position the right direction for the city? 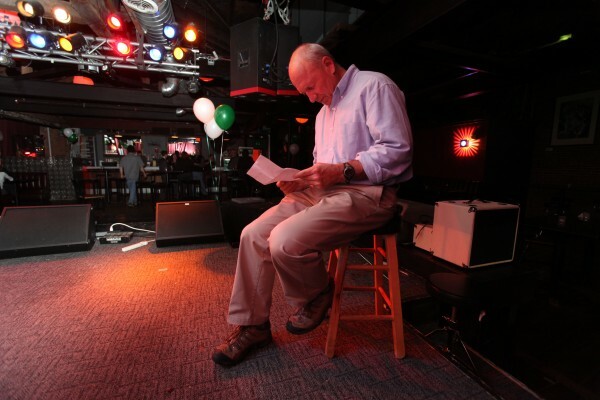 Then-Portland Mayor Candidate Michael Brennan looks over a breakdown of election results Tuesday, Nov. 8, 2011. PORTLAND, Maine — Having a full-time elected mayor in Portland City Hall for the first time since 1923 has provided a boost of momentum to a range of city initiatives, such as supporting local agriculture and streamlining the city’s permitting process, and has helped mend backroom divisions among city leaders. Those are some of the sentiments coming from Portland officials and community members as the first year of Mayor Michael Brennan’s four-year term nears an end. Brennan was sworn in on Dec. 5, 2011, less than a month after winning a crowded 15-way race to become Portland’s first popularly elected, full-time mayor in 88 years. In 2010, Portland voters narrowly approved a slate of charter changes that, among other things, installed a popularly elected full-time mayor position in city hall for the first time since 1923. Prior to the charter changes, the mayor was the chairman of the city council; one councilor appointed to the post by his or her fellow councilors. With benefits and an annual salary of $66,000 attached to the new job, some opposed spending more tax dollars on a position they believed wouldn’t be much more effective than the city council chairmen had been. “I was a skeptic of [having] an elected city mayor when I was on the charter commission, but now that it’s in place, I feel much better about it, and I think it’s working well,” said Thomas Valleau, a member of the city charter commission which recommended the recasting of the position. Valleau was in the minority on the commission as an initial opponent of the elected mayor position. City Councilor Nicholas Mavodones was the last council member to hold the appointed mayor post, and, like Valleau, originally opposed the change. Mavodones said that spending an initial $66,000 annually for salary on the position is “worthwhile.” He said it was a challenge to work a full-time job — he’s the operations officer at Casco Bay Lines — and also respond to all the demands of the mayoral position, even when it was a council chairmanship. “I’d get many, many calls and emails every day [regarding city business],” Mavodones said. But while Valleau and Mavodones have come around to seeing the benefit of a full-time, salaried mayor position, the mayor said he knows there are some skeptics out there. The continuity allows Brennan to follow through with a wide range of initiatives he has launched in 2012, he said. He has started a local food initiative, to drive the amount of local produce used in Portland schools from 7 percent to 50 percent over the next five years; and a business outreach program aimed to glean ideas for an overhaul of the city’s permitting processes, which long have been criticized as cumbersome. Brennan has played a key role in establishing a coalition of mayors of the state’s largest cities, and on Tuesday he brought together representatives of University of Southern Maine, University of New England, Maine Medical Center, the Gulf of Maine Research Institute and Maine College of Art to talk about forming a “research triangle” in Greater Portland, a main objective of his 2011 campaign. Brennan said he’s taken part in 600-700 events or meetings during his first year in office. James Cohen, vice chairman of the city’s charter commission and a former council-appointed mayor, agreed. “The position is already showing that with time and with the authority to lead, he’s been able to start and move ahead with a range of initiatives, from economic development, to getting involved with education policy, to creating a platform for mayors around the state to advocate for their needs in Augusta,” Cohen said. City Councilor David Marshall, who vocally supported the restoration of the elected mayor position and finished fourth in the 2011 mayoral race, said the four-year term also is important because it renders moot any backroom jockeying among councilors for the chairmanship. Ethan Strimling, former state senator and another candidate in the 2011 mayoral race, said he thinks the position doesn’t have enough authority. Leading into the 2010 vote on the charter changes, the Portland Community Chamber was a strong advocate for the return of the popularly elected mayor post. A year into the term, Chamber consultant Christopher O’Neil said the organization still believes creating the new position was the right path. O’Neil said business leaders in Portland appreciate Brennan’s efforts to visit at least one business every two weeks and discuss ways in which the city can be more helpful.